This post is from Kelton McMahon, post-doctoral fellow at WHOI and KAUST after the first day of diving near Kanton Island. Read all of Kelton's posts here. Pictures by Keith Ellenbogen. No matter what you do for a living, how old you may be, or how experienced you are (or think you are), the desire to explore seems to transcend all. We spent two full weeks taking photos, collecting samples, and surveying species distributions and abundances on the reefs fringing the Phoenix Islands. But like the thousands of photos we’d taken since arriving, our view of the reef was only a snapshot of the diversity and complexity that the ecosystem had to offer. As the sun set behind Nikumaroro Island, we donned our dive gear for a night dive exploration. 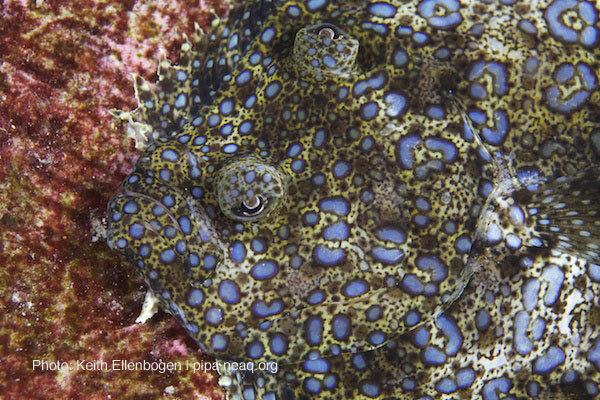 The reef gets a complete makeover at night: new species, new colors and a new perspective of how the system operates. Some species are just settling down for a good night’s sleep. A green sea turtle sits on a sandy patch of bottom, holding its breath long enough to catch a few Z’s. 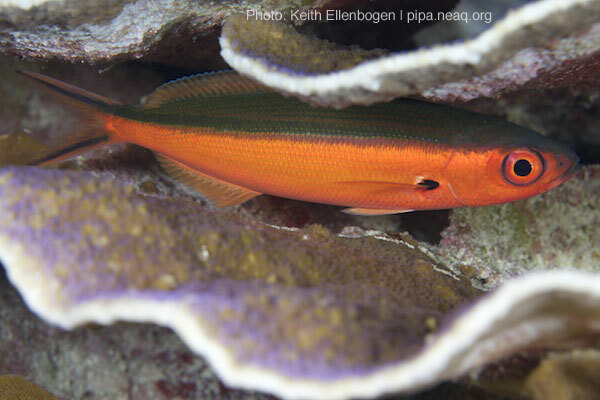 Take a look under a nearby coral ledge and you may find a parrotfish encased in mucus cocoon. At the same time, an entirely different suite of animals are just waking up. 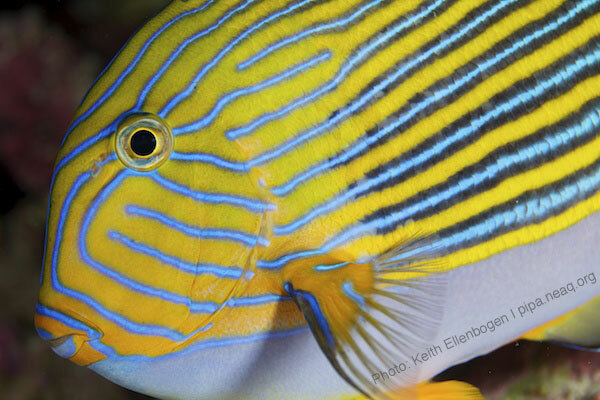 A neon fusilier fish changes into its night colors for a evening cruising the reef. Meanwhile, a few large solitary shadows glide along the outskirts of our lights looking for a snack. 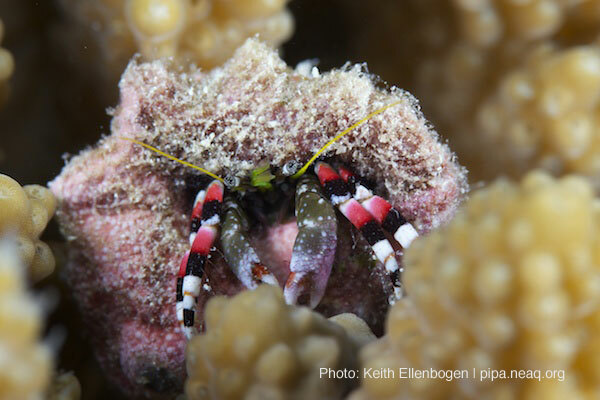 Don't let the fuzzy, turf-algae and sediment-covered shell fool you - there's a brightly colored hermit crab inside! Diving by the narrow scope of an underwater flashlight has a way of emphasizing the tiny creatures that come out at night. As we scan the reef with our light, a myriad of iridescent eyes light up. As my light passes over a colorful hermit crab it freezes. Move the light away and he picks up his shell to scurry along his path. Bring the light back and he freezes once again freezes. It reminds me of playing red light-green light as a child. 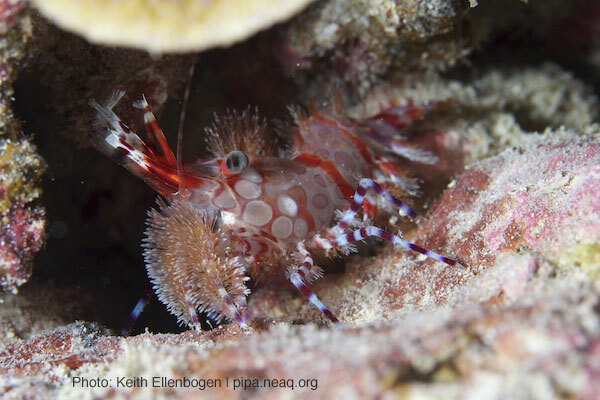 Under the next coral ledge, we see two banded coral shrimp sifting through particles in the water column. It’s hard not to imagine that we’ve stumbled upon an old married couple on a dinner date. As the dive comes to an end and we float suspended above the reef on our safety stop, a larval octopus dances in our lights. Back aboard the skiff, we cruise towards the Nai’a under a blanket of stars. Along the side of the boat, a pod of bottlenose dolphins rides our bow wake. As they crisscross paths below us, they trail plumes of green bioluminescence like jets in an airshow. It was the grand finale to yet another amazing exploration of the Phoenix Islands.